Our 7th Annual Mathletes Cindy Frank Memorial 5K Run & 1K Walk is scheduled for Saturday, 05.04.19. 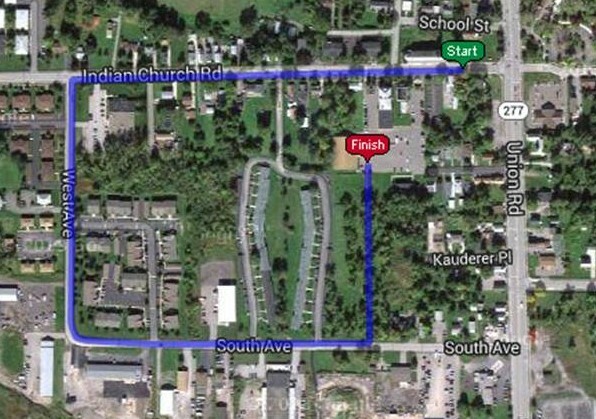 Runners start at 9:00 am from in front of 14 Holy Helpers Church on Indian Church Road in West Seneca, New York. They stay left at the Y and continue on Indian Church Road. Turn right onto Deer Chase Road which turns into Royal Coach Road. Turn Right onto Mineral Springs Road. Head back down Indian Church Road and end at the professional finish line on the parish grounds in front of our parish hall. Walkers start at 9:15 am from in front of 14 Holy Helpers Church on Indian Church Road in West Seneca, New York, turn left on West Ave, then left on South Ave, turn left and walk through our Cemetery and ends in the parish parking lot. It is a nice flat, safe walking route. Trophies to Overall Top Male & Female Finishers Awards in each age group and recognition to Top 3 finishers in each age group. USATF Certified Course and Sanctioned Event. Flat, fast, safe Course. Medals 3 deep in 5 year age groups presented at our family oriented post race party which includes canned beverages and food with entry fee before and after the race. Also featuring bounce houses, theme tray raffle, split club raffle and Music. Quickly developing into the premiere Early Spring Racing Event. Great for both experienced and novice runners. This race is in honor of the late School Teacher of 35 years, Mrs. Cindy Frank, and benefits the Hospice Angels Fund and the Fourteen Holy Helpers Student Scholarship Fund. You can run the 5K or walk the 1K. To print a mail-in Registration Form, please click Paper Registration Form..
All Runners and Walkers have a choice of either a Runners shirt or a Cotton T-Shirt. Please click here for the Race Route. Please click here for the Walkers Route. # Please click here to like us on Facebook. You can view photos from previous races her also..